Please please please. Just dont buy this game! Its one of the worst games ive ever played in my life. Seriously get a different game. I'll get in here before the hate arises. Mechanically this game is great. Yes it's light on content but it doesn't detract from the fact it plays well. I've had this since day of release and have obtained a play trophy to boot. As with all games like this I'm awaiting some new content to draw me back. Want xbox at this price. Yeah just notised and then had a £5 off voucher pop up so £21 for me and ordered. Please please please. Just dont buy this game! Its one of the worst games …Please please please. Just dont buy this game! Its one of the worst games ive ever played in my life. Seriously get a different game. And some people's xboxs, some people's toasters, some people's cars and some people's space rockets. And some people's xboxs, some people's toasters, some people's cars and …And some people's xboxs, some people's toasters, some people's cars and some people's space rockets.What's your point? Really?the PS4 version of Anthem crashed an Xbox?got any proof of that,dafty? 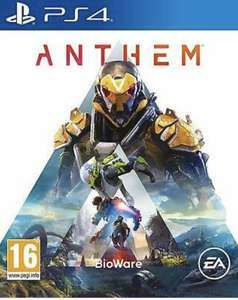 Really?the PS4 version of Anthem crashed an Xbox?got any proof of …Really?the PS4 version of Anthem crashed an Xbox?got any proof of that,dafty? lol rot in hell EA. I do feel for bioware. Forced to use a game engine that really isn't suited to the task. The kotaku article about this games development is worth a read. You didn't say the game crashed the consoles, just that it crashed "like" the consoles, dafty. Therefore my reply is clearly pointing out other things which crash also, all the best with your struggles learning to read and write basic sentences, I remember them myself back when I was 4. Cheap. But I won't being myself to play it. Tried the alpha and was bored in less than 45mins. Didn't bother with the beta. I'm hanging out on this until more content is available. I played destiny 1 the minute it came out. Content dried up very quickly but I persevered with it and became one of my favourite games. I'm sure things will get really good for this game over time.